This is not a good post. It is all over the place and I am trying to say too much in one post. Nevertheless, so much writing has gone into it, so I will publish it. "This week up to 17 Catalyst staff will leave the building, one of the top teams in the world dedicated to science communication, with not a farewell, a handshake or a stale biscuit – like felons out onto the street," Williams wrote in an email to fellow staff. So wrote Robin Williams, presenter of ABC Radio National's Science Show. I think the cancelling of Catalyst with the loss of a number of experienced ABC science journalists is appalling. The show is to be replaced by a number of one hour science specials over 2017. Yawn. My boredom threshold likes bite sized Catalyst style reporting. I hardly think one hour science shows will have much appeal. Young people have an even lower boredom threshold than I do, so if our ABC is trying to attract younger audiences, then I am not sure that is the right way to go about it. The standard cry is, 'The ABC needs to attract younger audiences'. I have been hearing this this since I became a viewer of and listener of our ABC back in about 1980. At times our ABC does attract younger people with specific shows or even radio stations like Triple J. I would guess many of the audience of Rage will go on to be people of influence in society. But when people get to a certain age, they often gravitate to our ABC. That is its prime audience and ABC management would do well to remember that. Closer to my heart is ABC Radio. 774 ABC Melbourne is to be rebranded as ABC Melbourne, or something like that, as are all local radio stations. Who cares. I already say ABC Melbourne if I refer to the radio station. There does not seem to be changes aside from that to ABC local radio. Good, although I have increasingly turned off local radio because of the amount of music played and focus on music. Our local station has a musician as a presenter in the afternoon, so I just switch off. The 'Drive' presenter has advertised his Tracks of Your Life ad nauseum, and while I don't mind him as a presenter, again too much music. So, I do not like music on my local radio talk station. It is boring. And that brings me to Radio National. I haven't listened to it for years. It has music but that is to be done away with. Good. It is better known as a talk documentary station. When I say I haven't listened to RN for years, I am a voracious consumer of RN podcasts. Health Report. Law Report. Download This Show. Rear Vision. Science Show, selectively. I say that because the podcast is conveniently broken into individual segments, so you download what interests you. There are so many more podcasts I would like to listen to, but I am time restricted. While ABC staff have protested against the changes, ABC presenter Emma Alberici says change is necessary for our ABC to be more relevant. Do I see a future Liberal Party politician in the making? What you think about in the early hours of the morning can be really weird. This morning at 5:35 Lobby Gore, aka Elle McFeast, came on the radio, replacing former Skyhooks band member and now ABC Melbourne morning radio presenter Red Symons while he is on holiday. I will miss Red during his absence. I like the way he presents. He is somewhat unprofessional and in a minor way he reminds me of ABC Melbourne's breakfast presenter, back then known as 3LO, of Peter Evans. 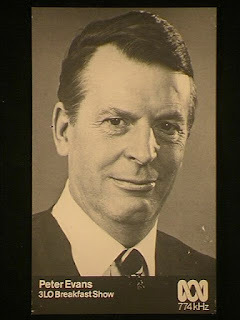 It is a massive compliment to Red Symons, because while he is far better broadcaster than Peter Evans ever was, I am not sure that there will be a book written called Symonds The Wireless as there was Evans The Wireless, and nor will there be cassette tape compilation of Red Symonds moments on radio. I think we were travelling to Bendigo in about 1981 when we first tuned in 3LO and heard Peter Evans, or didn't hear him as was the case, because at some point he did not say anything for many seconds. He came back with, sorry, I had to get my cup of tea, and then went on to complain about the ants in his Doncaster unit. These days with such a pause in voice, auto signal breakdown music would kick in. Red Symons has his producer come on to chat at about 6:45 and she is known as Harriet Hashtag, so called because she is well versed in Twitter, especially with news from Scandinavia. Peter Evans used to have his producer come in for a chat too, Jeanie James. I suppose she would be dead now too. I think I met her once at a Friends of the ABC protest meeting at Dallas Brookes Hall in the anti fund cutting to the ABC rally under PM Fraser. Some things never change. But she was never given her own microphone and talked off mike through Peter's , so she could not be properly heard. Microphones must have been expensive back then. As I said, the things you think about and remember at 5:30 in the morning. 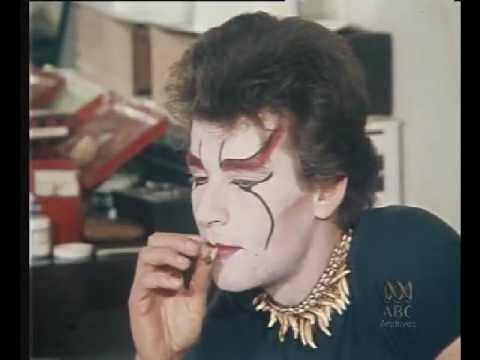 Photo of Red in the old Skyhooks days. I can't recall the years now, but at an early point Evans broadcast breakfast radio for the whole of the east coast of Australia before becoming more local to Victoria and other local radio presenters were employed and given facilities. I love our ABC and we have been together for a long time. At my age there is not too much I am passionate about, not like with the passion of youthful ideals, but I would go out onto the streets if Our ABC is under direct threat. Time will tell, but I didn't think much of the appointment of Michelle Guthrie as managing director, and it does seem like she is going to shake things up but not necessarily in a good way. 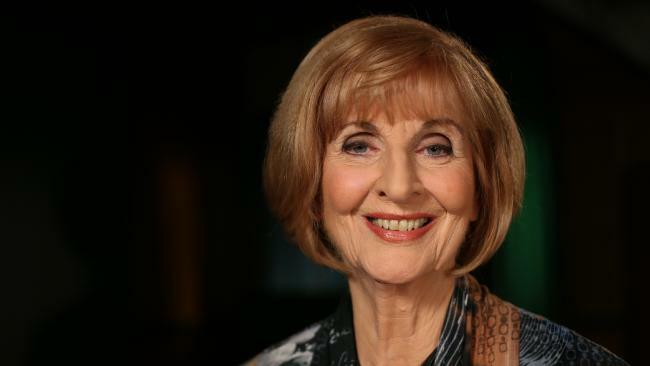 To note, The Fossil as we call her, Caroline Jones is retiring from ABC. In the early days of Australian Story, she used to have a soft focus lens on the camera. It was just so silly and so obvious, like the soft focus on Marlene Dietrich in Just a Gigolo. Fifty years in various roles at our ABC deserves a congratulations to the always perfectly groomed, very smooth and thoroughly competent Caroline. While nothing too much new is happening in Melbourne for local radio, it is good to see some openly gay presenters being given roles at our ABC. R was not amused when I told him. Why do they need to tell everyone one? No sweetheart, they are not. They just live an open life and probably don't wear being gay on their sleeve, but nor do they hide it. Kind of like us really, hon. 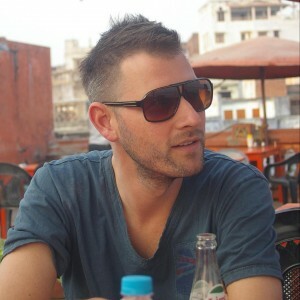 Josh Zepps (sic), now ABC Sydney radio evening summer presenter, son of the terrific actor Henry Szeps. 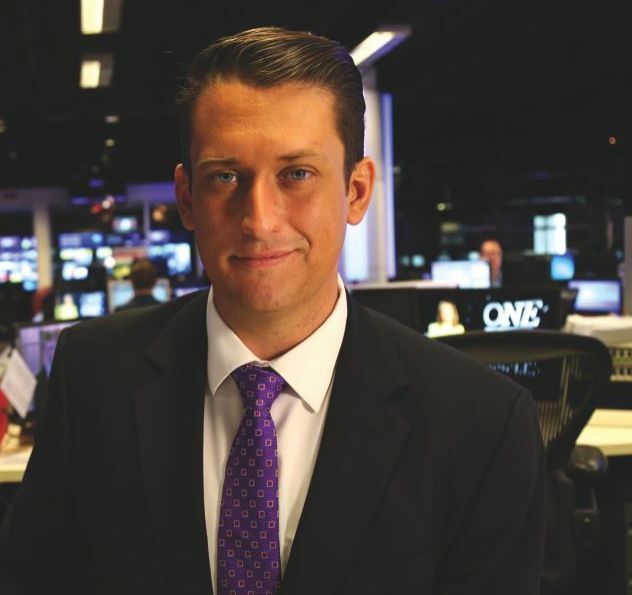 ABC TV Canberra evening news presenter in the new year is gay and part Aboriginal. Again, he won't open the news reading with, Good evening, I'm Dan Bouchier, I am gay and part Aboriginal. Google him and you can find out both, but I doubt you will otherwise know, and it is hardly relevant to his news reading ability. Other good new radio talent is Sammy Shah. 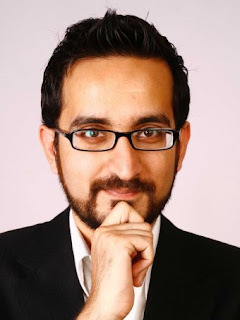 While he does have a Pakistani accent, his English and diction are excellent and he is funny, quick witted and knows about stuffs. I hope to hear more of him on our ABC. Sammy is not guilty by association. He is married and with children. So much diverse talent at our ABC, yet still Macca drones and bumbles on and on every Sunday morning. Lastly, about 25, maybe 30 years ago, I would occasionally tune in to 3RRR, a subscription radio broadcaster here in Melbourne. It could be quite challenging to the status quo at times, and hence at times controversial. 3RRR has turned 40 and this appeared outside our state library. I have just noticed, it is the oldest independent radio broadcaster in Australia. Long may 3RRR last and gotta love those old radio cassette players. Don't tell me you breached copyright and recorded from the radio to a cassette tape? I am in trouble folks. Perhaps I can get out of the fine though because Australia don't use zip codes but post codes. Also, the normal way of expressing our dollars when it needs to be known that they are Australian dollars is AU$353.79. Well, that is how I do it. Why mention that it is Australian dollars anyway, given I was assuredly in Melbourne on that day. Oh dear, the spell checker has a problem with infrigement too. I have seen some very convincing scams and phishing. This is not one of them. And of course any reader is smart enough to not click on the link. While we often see cars coming the wrong way down this one way part of Toorak Road, this morning was exceptional. Like sheep over a cliff, two cars followed the leader. Now bear in mind that no driver in this situation can see a red or green traffic light. Yet sit they do until either someone tells them or they take action against the lights, or just make a U turn, which is what the two cars behind the leader did. Still the driver sits as the traffic lights cycle through. It was early morning and there was little traffic going the other way. Now here comes a Mini after the other two cars turned back. Finally the car turned left into St Kilda Road and the Mini made a U turn. Often these are cars coming out of side streets, but in these instances they weren't. They just drove down the wrong side of the road. While I think they are stupid, when so many people are stupid, maybe there is signage or road guidance problem. Only a few weeks ago I was contacted by a book author with a request to use one or two of my blog photos. Oh, I am to be a famous photographer! I was quite happy for my photos to be used, especially as it was a worthy cause. Firstly I had to dig around and find the blog posts with the photos so that I had a date, and then dig around to find the originals on cd at full resolution. I found them and emailed the photos. It seemed to be a very short time line from when I sent the photos to when the book was launched with a guests the very decent Tim Costello and the local State Parliament member. I was invited to the launch but I was working. First contact with me was made on November 16th and the book was launched on November 30th. While I have not read it yet, it looks absolutely terrific. R is keen to read it too and it is a book I would have paid the $30 to buy. My interest? I have lived longer in the City of Port Phillip, Elwood, Balaclava and St Kilda Road than anywhere else. I do rather like being a citizen of CoPP, much as I complain at times, especially about this little underfunded and neglected enclave of St Kilda and Queens Roads. Even the late Baroness of Balaclava gets a run in book, I noted as I flicked through. 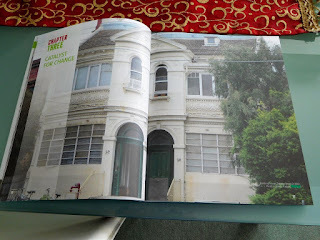 I researched the Port Phillip Housing Association and how it is funded some time ago. From memory after seeding funding by the City of Port Phillip, it is a self funding housing trust with income from tenants. The web site is very informative and can be found at this address http://www.ppha.org.au/ . The book was launched at the St Kilda Town Hall on the 30th anniversary of the setting up of the trust. The book is available from the Port Phillip Housing Association, in person or by mail plus postage. Contact details are at the the Housing Association website listed above. As I said in a previous post, we drove to Geelong to see Little Jo perform. The train was most unsuitable time wise. For some reason the car pulled to the left as we passed the Scottish Restaurant in North Geelong. It is true. We have always stopped there for refreshment of some kind in the past, from the days when our very old friend lived at the foot of Mount Elephant or later when Sister first moved to Geelong, before she moved to the Bellarine Peninsula. Sister first rented a house in Newtown when she began teaching at a posh private religious school, Newtown being an expensive Geelong inner suburb. One of her co tenants was a Federal Policewoman, I suppose of the same sexual persuasion as Sister. She was a useful person to know as at least once she got Sister out of serious trouble after Sister had a mental snap of the relationship breakdown kind. Sister then bought a three storey unit in the suburb of Belmont. It was a nice place on a steep hill. The entry was to the living room, kitchen, a bathroom and two bedrooms, one with an ensuite and a great decked area. Downstairs was another bedroom, laundry and bathroom and underneath was a utility room and garage. Sister kept the unit, and she and Bone Doctor bought a flat in Murrumbeena, where Little Jo mostly grew up, with a sojourn in Bendigo and Wangaratta as that is where Bone Doctor's work took her. They then rented on the Bellarine coast and bought a house nearby their rented place and sold the Geelong unit, and I expect there they will stay. They still have the Murrumbeena flat, rented out of course. Before Sister moved to Geelong, I had been there maybe once many years ago. I knew nothing of it. Geelong went through a very bad depression after the collapse of the Pyramid Building Society in the late 1980s. Pyramid Building Society? Pyramid investment schemes? An unfortunate name, and folk would do well to look at what happened to building societies in Australia in the 1890s. With a Melbourne mindset, I spied a vacant car parking space, just one kilometre from our destination, the new Geelong Public Library. Should I park here, I asked R. No, he said. We will get something closer. We parked about five minutes walk away from the library and lo and behold, there was vacant car parking right in front of the library. I think it is a great looking building. It is not often public seating comes with a table. There was more than one set around. But before seeing the library, we were distracted by Geelong Art Gallery. It is excellent, with many interesting works, most of which did not turn out well in photos, but this old Victorian Railways travel poster in a better naturally lit area was the exception. I am not a great one for gift shops, but I thought the gallery's gift shop was quite good, with quite a number of items for sale under the name of New York's Museum of Modern Art. The gallery's web site is geelonggallery.org.au/about and there you can see a photo of the front of the gallery and not the rear where we entered. The library next door was being very well used on a Sunday morning, so I couldn't really take photos. It is a vertical stack of five storeys with each floor having a different colour scheme. It too was very impressive although I did not notice a lot of books. Libraries are now so much more than books nowadays. Even though the day was quite warm, it was dull and overcast. Nevertheless the views from the fifth floor terrace were wonderful. The gallery and library sit above Johnston Park, with its central amphitheatre. The historic Geelong Railway Station can be seen to the left. It is an hour to Melbourne by train or car. The church where Little Jo was to perform, formerly a Methodist Church I believe, but I am unable to easily find a name for the church . We parked nearby and walked a couple of hundred metres to The Botanical on Ryrie cafe where we met Sister, Bone Doctor and Little Jo. It is not a cheap cafe, and you get what you pay for. The staff were terrific and so nicely dressed and the food was good, as was the atmosphere. Sister and Bone Doctor don't live in Geelong, but we can't even go to cafe without Sister getting recognition. One of the diner's next to us was Sister's workmate's daughter. Look out, here comes a patient of Bone Doctor. Ah, here comes the partner of one of the receptionists at Bone Doctor's practice. The church hall and I think at the rear the former manse can be seen. Modestly Methodist, hey. Geelong has some brilliant architecture and just lovely houses. I could pick the grumpy visage of Queen Vicky from quite a distance. I am afraid to say it did, but I don't know if the world is all the better for it. I had heard of Geelong's Botanic Gardens, but what I thought was the gardens is actually Eastern Park, with the botanic gardens on the northern side of Eastern Park. Bone Doctor gave us a guided tour. There were a number of boab trees. Within their bulbous trunks is water, which they can store for a long time for extended periods of drought. Representations the garden's first curator and a young lady. She is looking a little guilty and her hand is hidden behind her back, containing a flower press. She wants a flower from the pot he is holding to press. Sadly, a non functioning fountain. I believe there is some state or federal government money available to restore old fountains, and I really wish Geelong would take up the offer, if available. Cool walking on a hot day. I did not get to check these plants closely to see if they are geraniums or pelargoniums. While this fountain has moving water at its base, it is not really functioning as a fountain should. This house is opposite the former church where Little Jo performed. Geelong must have been a rich late nineteenth century town, built on wool I suppose. After the show, on a quite warm day, we wanted an icecream. Little Jo was cooked like a chip in her costume. We found a place in the centre of town and after devouring our various flavours and a bit of swapping around, we headed for home. Oh yes, I have left out any mention of the performance. R went to see Little Jo perform mid year and he said she was terrific. It was a performance of Alice in Wonderland this time. I quite enjoyed relearning what I had mostly forgotten about the show. Let me very cruelly say the standard of performances was quite low. Little Jo did not stand out and is not beyond criticism. She played the White Rabbit. Generally everyone's lines were rushed, with little vocal projection. One lad, I forget his role, had a long speech and he remembered it all, which was a great achievement, but it was painful to hear. The teacher is an older female actor who owns the business. A younger male actor is her consort and he narrated and prompted. There was such effort put into the show, but it was not great, even though we were quite entranced. As Little Jo de-costumed, the obvious had to be stated and Sister did so herself, saying Little Jo was not so great in the show. Later without comment, I listened to Sister and Bone Doctor discuss what Little Jo's focus in the performing arts should be next year, singing, dancing or acting. It pains me to say, none of the above. Little Jo is very clever and I am not sure the being very clever and being a star stage performer are compatible. But what the heck. I am a grumpy old man. If Little Jo enjoys performing arts, does it matter?